"Fantasy Fiction", a genre that I never really explored after reading the entire Harry Potter series. I started following Harry Potter movies and books because I was curious to know what the hype was all about &amp; when I did, I fell for them instantly, followed it up with The Lord Of Rings series and many others but that was restricted to movies only. Never laid my hands on the books. 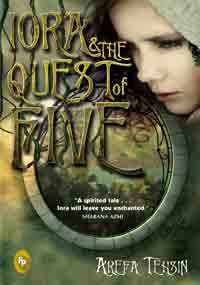 So, technically, "Iora &amp; The Quest Of Five" is my first fantasy fiction after Harry Potter and I quite liked the idea of the book. I absolutely love Twitter (The Social Networking Website) and when I got to know that Iora belongs to Twitterland, a jungle, the book had me gripped already. Iora, a eleven year old girl is highly inquisitive and well mannered. Her father, Heron, takes her out for walks in the jungle to make her understand and explore what Twitterland has got to offer. The story begins when Heron leaves for an excursion leaving Iora with her grandfather, Cockatoo, and the curious Iora gets bitten by an rogue thorn worm, while she goes out for a long awaited task. While she goes numb after getting bitten by the worm, she hears some voices saying, they need her father's blood to proceed with their task. This marks the beginning of Iora's quest of five. She starts her journey to Wacky Wilderness, an enchanted jungle, with a dwarf named Beetle and her childhood bosom foe Owlus, who joins them in between. During their quest, they meet a lot of jungle clans and come across a lot of weird things. During her quest, she finds out, its not just about her father, whose life is on stake, the entire jungle is condemned. I loved the way Arefa Tehsin has written the book. She has successfully managed to create a whole new world with a lot of interesting things which are logically defined and has narrated the story really well. The book could have been a bit shorter though. I would definitely want to see an animated film based on the book. The book has got some brilliant ideas which can be churned to make a good animated film. The book can be read by both young and adult people. It will keep you hooked to it. sounds good .. and u call 300 pages long ?? Long as is the narration. Could have been a bit shorter. hahaha...Yatin, bro u need to come over to my house for a few fantasy books. With over 1000 pages in each and with tiny prints and with 10-12 more books before the story concludes, u might just want to kill me. Hehe, As I said in my review, this was my first encounter with Fantasy Fiction. I am surely gonna take your reccos in future and will explore it more. Yeah start a series .. of min 5 books :P n u might spend year finishing that specially if some part isnt out yet ..
Hi Yatin, Iora here, from the Twitterland itself!! Thanks so much for reviewing my book. I'm glad you found it to be interesting :) And I love the movie idea too, Im waiting for the Bollywood offers to pour in ;) anytime soon.